Start delayed at the last minute due to a wind shift and then a quick course change to accommodate. Right at the committee boat end of the line at the start and once in some clean air made good progress but then it looked like the boats further up the line were getting better wind. Quite a long beat to the first mark (Royal Thames) and after about halfway looked pretty good on the fleet and kept up with some of the bigger boats. Minor issue with the GPS route picking the wrong buoy but did not loose too much. Spinnaker up for the leg to DAKS and again seemed to be keeping up with the higher rater's but as we got closer into the Island the wind started to drop off. Good drop at the mark and headed up to Hamble Yacht Services but again the wind dropped off as we approached and once round seemed to die altogether for a while which let all the smaller boats close up behind us. 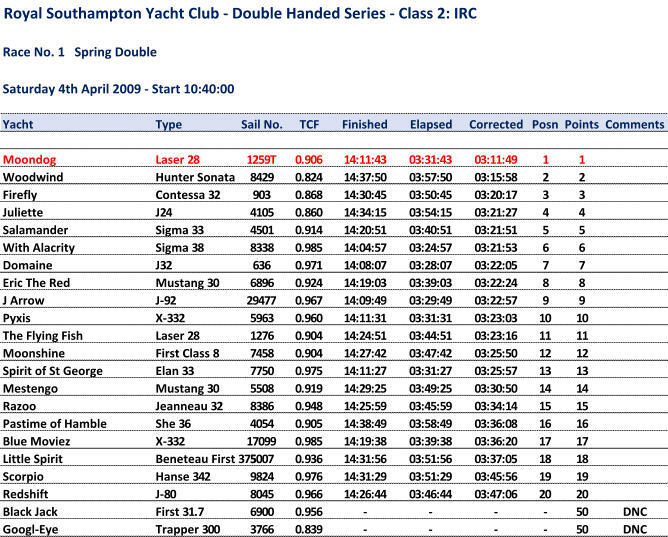 Wind filled in again after a bit and a beat to Quinnel with a short spinnaker leg to the finish at Royal Thames. Tried to clock the rest of the fleet finishing behind us to see if the low rater's were close enough but obviously they weren't as we got first on corrected by over four minutes.